Unless you count the time Zan tried to master hand-pulled asian noodles while I was away on business (gotta love his the lack of hubris), it’s taken years to work up the courage to try making pasta from scratch. We were just days into our stay in another country, in a stranger’s apartment with access to only basic utensils. Hubris in check, we kept our first shape simple. 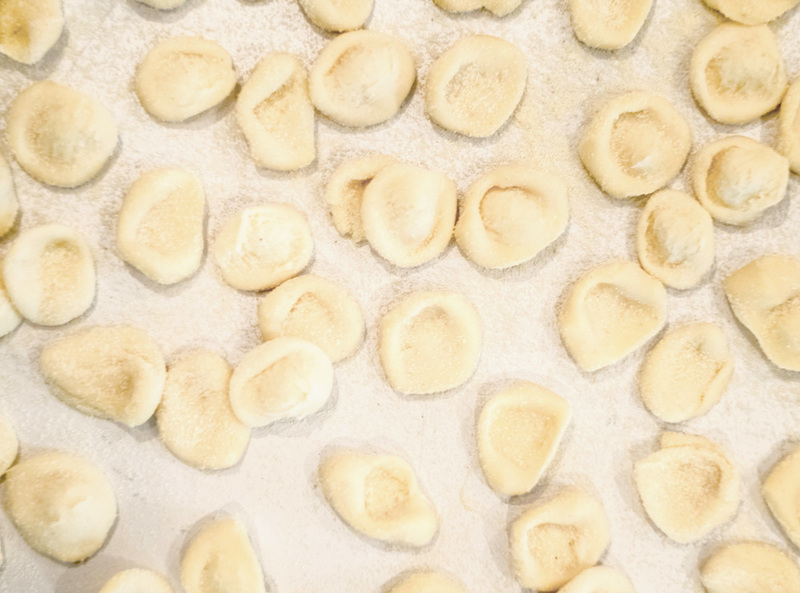 We chose orecchiette (translation, ‘little ear’), a pasta from the heel-shaped region that completes Italy’s boot. We made it a few times then invited our hostess to dinner. It was thrilling! Not only because it was not disgusting, but because it tasted like only made-fresh-with-our-loving-hands-then-delivered-straight-to-your-heart could taste. It was also a poignant reminder that great meals have less to do with experience or equipment than they do with intention. In our kitchen, the most prized ingredient is not saffron or truffle — it’s time. Time to cross reference dozens of drool-inducing recipes, gather fresh ingredients and slow dance between mixing and rolling. And, of course, time to truly savor the meal, meditating on all the lovely things that make it worth the extra effort. Connected to time, sharing is the other essential. We learned this one years ago when we started Social lunch —a weekly meal where work comes to a halt so we can gather as a team and break bread. It’s still one of my favorite things about Social and, no surprise, our longest running office tradition. We hosted this past Social lunch at our home and everyone took part in the pasta making. And while we shared the tips and techniques surrounding the making (not to mention calories), we also shared the intangibles that make a meal truly memorable — good company, lively conversation and positive energy. Time may be limited, but sharing knows no bounds.